MINNEAPOLIS, MN—As a commodities trader Ed Vigil has spent his career diversifying portfolios to manage risk. He applied that diversification strategy to his bike business by creating a corporate division servicing the premiums and incentives industry. PORTSMOUTH, NH (BRAIN)—A new Trek Bicycle Store opened recently in the historic seacoast town of Portsmouth, New Hampshire. Retailer Scott Berger and two business partners opened Trek Portsmouth early last month after about a year of planning. GREENWOOD VILLAGE, CO (BRAIN)—Performance Bicycle, which operates 85 bike stores across the country, has launched a new store design with a relocated store in Greenwood Village, Colorado. SCARSDALE, NY (BRAIN)—Danny Cycles in New York State has been dealing with wet weather for the last month, and the forecast for this week doesn’t look much better. SEATTLE, WA (BRAIN)— REI is launching the Bike Your Drive mobile iPhone application, a free interactive tool that helps cyclists track, view and share their bicycling experiences. LONGMONT, CO (BRAIN)—After 23 years in business Colorado's High Gear Cyclery is closing in the next couple of weeks due to the tumultuous economy. ROCHESTER HILLS, MI (BRAIN)—KLM Bike and Fitness celebrated its “Grand Reopening” at its Rochester Hills, Michigan, store on Saturday, May 30. The store is the 16th Giant Retail Partner (GRP) Podium store in Giant’s growing list of retailers employing the brand’s business approach. RIVERVIEW, FL (BRAIN)—Just Ride Bicycles in Riverview, Florida, the newest bicycle store in the Tampa Bay area, is inviting all bicyclists for its grand opening event on June 4. SALT LAKE CITY, UT (BRAIN)—Backcountry.com has launched two new bike stores: HuckNRoll.com, dedicated to mountain bikers; and RealCyclist.com, the world's first exclusive road cycling shop online. BOULDER, CO (BRAIN)—Leisure Trends Group (LTG) now has open enrollment for independent bicycle stores that want to join the nearly 200 dealers that have signed up for the new information service, which will begin publishing reports this summer based on point-of-sale transactional information beginning in June. NEW YORK, NY (BRAIN)—Cadence Cycling & Multisport will close its Manhattan studio on May 17, citing slow sales due to the fall of the financial sector in the city. 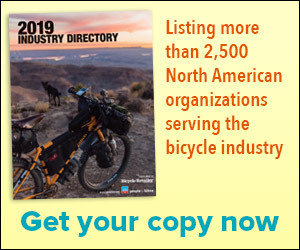 TORONTO, Ontario (BRAIN)—More than a year after Canada’s Mountain Equipment Co-op announced its intentions to enter the bicycle business, tensions continue to mount between the co-op and the country’s independent bicycle retailers. PETERBOROUGH, N.H. (BRAIN)—Eastern Mountain Sports has opened a new store in SoHo at the corner of Spring and Broadway. MYRTLE BEACH, SC (BRAIN)—The fires that have ravaged more than 30 square miles of land have not affected local retailers. EMERYVILLE, CA (BRAIN)—Upland Sports Group, exclusive distributor of Capo Cycling Apparel and Capo Custom Apparel, has moved from Oakland, California. FORT WAYNE, IN (BRAIN)—After 96 years in business, longtime Indiana retailer Koehlingers Cycling and Fitness has closed its doors. LADERA RANCH, CA (BRAIN)—Ladera Cyclery closed its doors on Sunday after more than four years in business. The Orange County, California, shop fell victim to a combination of factors including plummeting sales in February and March, low cash flow and sky-high rent. PORTLAND, ME (BRAIN)—The newest Giant Retail Partner Podium store, Gorham Bike and Ski in Portland, Maine, celebrated its official grand opening this past Saturday. HUTCHINSON, KS (BRAIN)—Kansas felt more like Chicago this past weekend, burying parts of the Jayhawk State in more than two feet of snow and knocking out power to at least 17,000 homes and businesses. GREENWICH, CT (BRAIN)—A group of high-end retailers with expertise in fit techniques have formed an association to more effectively advertise their services.